In the Domain Manager, you can add valuable .com, .net, .org, and .co domain names to our Premium Listings for increased visibility. For more information, see our article about Premium Listings. 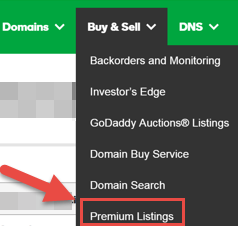 Note: You can only add .com, .net, .org, and .co domains to Premium Listings. Other domain extensions are restricted. When you add a domain name to Premium Listings, you must let us know how you want us to pay you when it sells. For more information about Premium Listing payments, see Commission rates for Premium listings. Note: You cannot add domain names that have transfer protection services, such as Protected Registration, to Premium Listings. Log into your My Products page. On the Premium Listings page, click Add Domains. Separating each value with a comma, enter a domain name, its listing price in USD, and on or off for its automatic renewal status (optional). Use separate lines for each domain name entry. For example, on one line, enter coolexample.com, 500, on if you want to sell coolexample.com for $500 and automatically renew the listing when it expires. To automatically renew the Premium Listings for domain names you didn't enter an automatic renewal status for in the previous step, select Automatically renew domains unless otherwise indicated. To use an existing payee account, select it from the list. To create a new payee account, click Manage payee accounts. On the Payee Accounts page, complete the required fields, and then click Save Changes. For more information, see Setting up Payee Accounts. Return to the Domain Manager to select the new payee account. Read the legal agreements that display, and then select I have read and agree to the terms and conditions.